US 42 from the church. A history of Beaver Lick Baptist Church. “The saw-mill of Edward Senour, of Beaver Lick, Boone County, was destroyed by fire last night. 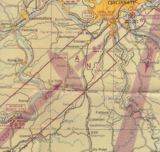 in the Fall of 1939.
a straight line between Louisville and Lunken Airport. This map is from May, 1944.
shape denotes a "Fan Marker Beacon" which existed at the place known as Beacon Light. These two images depict the same building. Minglewood, just east of “downtown” Beaver. Names in the back of this one are here. Boone County Recorder travels to Beaver in 1889, here. American Society of Equity holds a big rally in Beaver, read it here. If you've not familiar with the A. S. E., you'll want to read this first. An 1859 Gazetteer lists the merchants of Beaver Lick, here. “Beaver Lick is one of the most quiet villages on earth, especially on the Sabbath, though two shops are dealing out the deadly drug on week days. Thanks be to God and honor to the proprietors, not one drop is sold here on Sunday. We owe it to William Rex Robinson, who came and lectured to us until with tears in their eyes proprietors of liquor promised him they’d vend no more on Sunday.” from Covington’s Daily Commonwealth, September 16, 1879.